- Ren insisting to Mark that she'll pay him back every cent. - Lou telling Cheryl that Lolly is a cinch to win the baby competition. - Philip leaving No.26 to go to sleep in the news- agency, to get away from Julie. The next morning, Rick is ironing in the lounge room when Ren comes in and comments on the grubbiness of the room. She starts tidying up, and asks Rick for a hand, but Rick says he has to work as a maître d today. Mark arrives home with a box of groceries. He comments to his sister in surprise that she's actually vertical and tidying up instead of waiting for him and Rick to do it! Marlene has made some biscuits and Cheryl tells her that they look delicious. 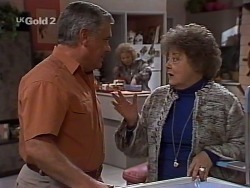 Lou asks Marlene if they could use her place for the entrée for the progressive dinner. Marlene says they can, but the cooking's out as she's stuck at the Waterhole… although if they kept it simple, Sam could give her a hand. Lou thanks her. 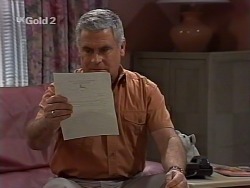 Jack has turned up and he shows Gaby his employment contract, all signed and witnessed. Gaby takes it from him with a smile. There are piles of clothes everywhere and Gaby tells Jack that she's been really hard on herself! Jack points out that she's leaving… she has to let go! Cody comes through the front door and asks if she's butting in. Gaby asks for a hand with her clothes. As Cody gets stuck in, she tells her sister that she's got a book listing all the things Danni hasn't done but has taken the blame for. Gaby asks her if she's going to dob to Miss. Teschendorff, but Cody pleads with her not to use the word ‘dob'. 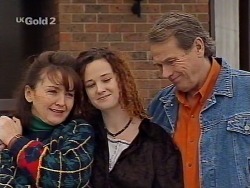 Gaby suggests she give the book to Cheryl instead. In the kitchen, Mark is giving instructions to Sam on how to prepare the entrée. They head out into the main shop, where Rick comes in and mutters about the fact that his face being on the posters has made Alan Crowley think he can run his life. LOU: She didn't come close. He goes on that the preliminary judges decided that neither the photograph nor the caption were suitable for further consideration. Cheryl exclaims that everyone who's ever seen Lolly says she's cute. She goes on that she's not saying Lolly has to be the winner, but to not even make the preliminaries… Lou admits that it does seem hard to believe. Cheryl murmurs that she'll be rational about this… for a few minutes, and then she'll tear them to shreds! 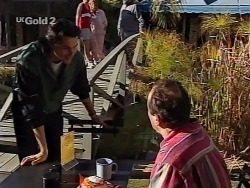 Doug emerges from the Waterhole with Philip and they sit down at a table. Doug comments that there are clothes everywhere, cooking for a dozen people, women screaming… the house is like a warzone! 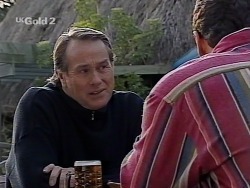 Philip asks gently if he's sure he didn't want to get away because of Gaby leaving. Doug muses that he still sees her as a little three- year- old kid with her arms up; it gets to him. He then asks how things are with Philip, who replies that he and Julie just don't seem to connect like they used to; they seem to be running in different directions, and instead of talking it through, they fight. Doug insists that it'll come good. Mark is dressed up and is polishing his shoes. Ren smiles at him that she did a good job on the living room, didn't she? Mark immediately asks her suspiciously what she wants! Ren tells him that she needs his car to meet some friends an hour or so outside the city. Mark, however, tells her that she can catch a cab; his car keys are staying right there. Ren seems to accept this, and she hugs him and wishes him a good night. He heads out. When he's gone, Ren stares at the keys to Mark's van, which are on the hallway table. LOU: Bingo! Our own contest with fair rules, run by us! What a clever little mum you are! The progressive dinner is underway and Pam is laughing as she tells some of those gathered that Gaby has been planning on taking her doona to Darwin! Gaby pulls a face! She heads into the kitchen, where Mark tells her that he's going to miss her and little Zac. Cody and Rick join them and Rick comments that he might go to Darwin to get away from Crowley the Crow! In the lounge room, Cheryl is ranting about how the man on the ‘phone would only say that the judges' decision is final. Pam comments that she supposes all parents say the same. 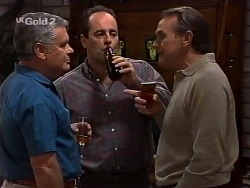 Lou joins Philip and Doug and asks Philip if he's on his own. Philip nods that he's going to have some fun. Doug suggests that they should go camping – just the blokes. Philip smiles that it sounds like heaven! 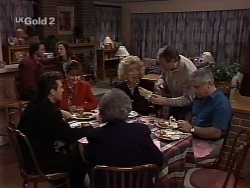 Marlene walks in with a tray of entrées and everyone gets stuck in. A while later, the main course is being consumed at No.28 and Doug says he hopes everyone appreciates the expert garnishes! On the couch, Sam is telling Philip that he walked into the coffee shop and met this incredible woman; they ended up having this conversation and he kept wondering where he'd seen her before – but he's going out with her tomorrow night. DOUG: Now, you're all friends of ours and Gaby's. Some of you have known her longer than others, but I reckon you've all got a pretty good idea why we think she's special: she's fiery, self- opinionated and bad- tempered! DOUG: She's also very smart, very loyal and very successful. She's a loving daughter and a wonderful mother, and she's given us our fair share of surprises. He reminds everyone about when Gaby dressed up as a tart to put potential buyers off buying No.26! He then asks everyone to be upstanding and charge their glasses, and he proposes a toast to Gaby, who smiles in embarrassment! CODY (grins): I guess you're an OK father for my nephew! PAM: The whole family's been wrenched apart. CODY: You've still got *me*. PAM: Yeah. Thank goodness for my baby. 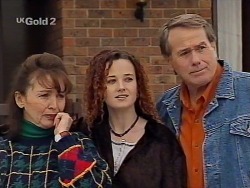 They watch as the cab turns left at the end of the road and Gaby leaves Ramsay Street for the final time.